Even if you don’t know eBoy, I’m betting you know–and love–their work. For over 10 years, they’ve been creating massive, hyper-detailed illustrations (like the one above) which have a deliciously geeky pixelated style. But it’s expensive to hire them, and they don’t do anything interactive. Until now! eBoy teamed up software developers Delicious Toys to create FixPix, a puzzle game for the iPhone. 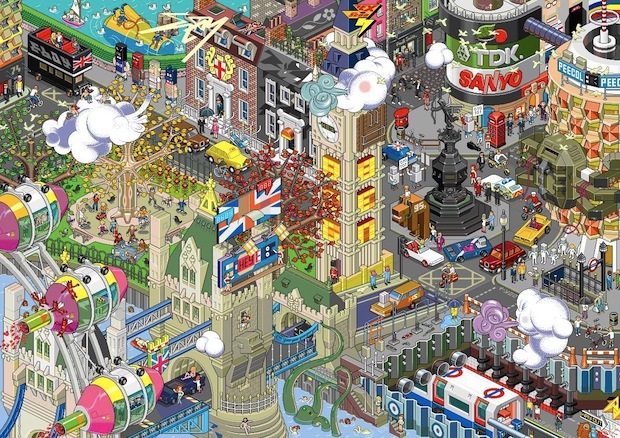 It’s like a jigsaw puzzle, using multi-layered, 3-D versions of eBoy’s work. To find pieces that fit together, you have to tilt your phone–thus rotating the image, and unveiling puzzle pieces that are hidden from view. In so doing, you’re exploring eBoy’s works at a level of detail you ordinarily never can–and seeing nooks and crannies hidden in a 2-D, printed illustration. You can play with a teaser here, and sign up for a notification once the app is available.